Labyrinth Ball Game Maze Red is a tricky maze where you have to get all the little ball bearings in black semi circles at the same time. 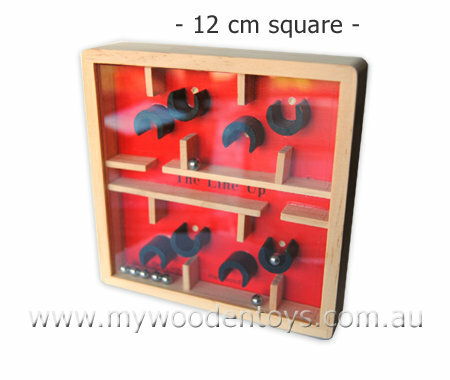 This great wooden toy is challenge and a very nice size at 12cm square and 2.5cm deep. This particular maze is a striking red and black and has a perspex top making sure you can't loose the ball. A great concentration game and one you can take anywhere. Material: Wood, small steel ball. We like this because: "It is very tricky and a great challenge."